This dessert drink is named after an Italian romantic comedy from the seventies. The name translates to "dear wife." The intended drinker must like coffee, because Cara Sposa is a coffee and orange liqueur cocktail with an ounce of half-and-half. 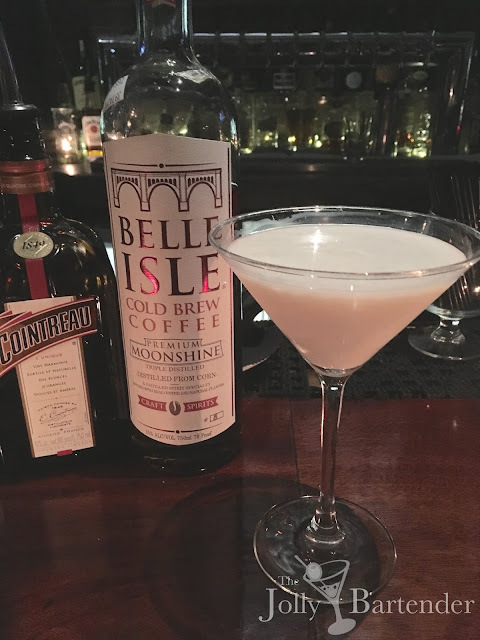 But to keep it a little drier, I used Belle Isle cold brew coffee moonshine. This spirit is heavy on real coffee taste and stronger than coffee liqueurs. I relied on the Cointreau to do the sweetening, as it should. The effect was a rich cocktail that tasted a little like a holiday treat with fresh oranges and real coffee with cream.